Another round of playoffs in the books for LCK and it’s Afreeca Freecs coming out on top over kT Rolster. This victory marks the first ever finals appearance for the Afreeca organization after a triumphant 3-1 over their star studded opponents. While Afreeca Freecs don’t have the flashiest roster on paper, their starting line-up from top to bottom is laden with some of the most consistent players in the LCK scene. Last season Afreeca was led by the heroics of MaRin in the top lane. With his departure from the squad during the 2018 offseason, Afreeca were looking for a new carry threat and ultimately a new identity as they lost one of their rising stars. The start of 2018 went much better than expected for Afreeca as they got off to a great start. While dynasties like SKT and KSW were going through changes in their playstyle and struggles in performances, the constant surging of Afreeca Freecs was hard to avoid as their consistency helped them to a second place finish. This year saw Kuro and Mowgli really come into their own as players. 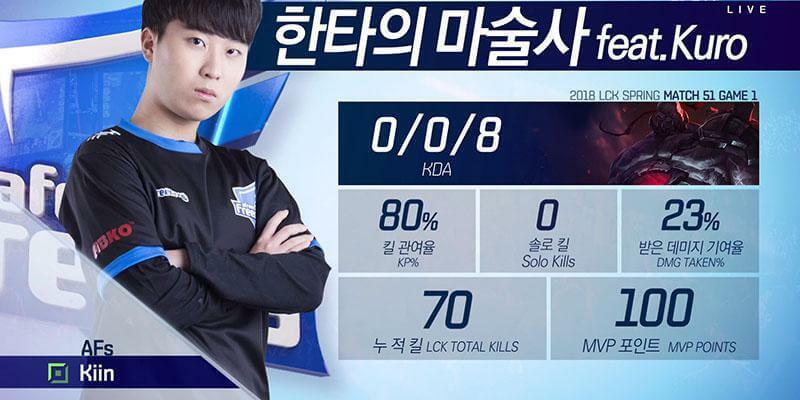 Kuro has been a top 5 mid laner for the past few years but his Spring performances have helped Afreeca to maintain long stretches of wins against teams like ROX and Kongdoo. Newly signed AD Carry Aiming was a revelation for the Afreeca roster early in the season but due to his disciplinary ban midway through the split, Kramer came in on full-time carry duties and his play flourished with the changes. If it wasn’t Kramer and TusiN pulling their weight on the bottom of the map, Spirit came in with Kiin to mop up advantages as Afreeca found themselves with a strong set of starters and subs capable of causing headaches for even the most seasoned coaching staff. The playoffs have always been a tricky mistress for Afreeca as they historically never were able to make it past the initial three match series in Round One. As a seeded roster with a guaranteed five match series, the odds were in Afreeca’s favor as they were allowed more flexibility for picks. The first game of the series was kT’s sole win as Rush and uCal got their team some solid advantages in the early game. The team composition was played perfectly for kT as they relied on their early game prowess to bully leads across the map with Olaf and Taliyah. While the first game seemingly spelled the beginning of the end for Afreeca, their resurgence in the series became a thing of beauty as Kuro and Kramer lead their team to a perfect Game Two comeback that saw them drop zero kills in the process. Even with Score entering the lineup for kT Rolster in Game Three, Afreeca Freecs continued to play a smart and concise game as they played the long game and focused on team fights rather than lane dominance. A bait into kT taking cloud drake meant Afreeca could swoop in and establish pressure in the mid lane. As kT came back to the tower in rotation the Ornn, Karma, Kai’ Sa combination for Afreeca paid off nicely as they immediately took out three members of kT Rolster and snuck a second win in under 30 minutes of play. The last game of the series was merely a formality for Afreeca as kT was already visibly affected by signs of tilt. Afreeca’s minimal mistake style of play frustrates the playmaking ability of stars like Mata and Smeb on the enemy team and Afreeca marched their way into a series victory and another showdown with the unanimous best team in the league, KING-ZONE Dragon X. Although every single pro player and analyst from opposing teams have tipped KZ to take the finals, Afreeca’s chance at the spotlight can’t be overlooked. What the team lacks in outright star power they make more than make up for with their team cohesion and ability to clearly make plays with each other. The unselfish style of play for Kuro where he puts his teams needs above his own need to carry has lifted his colleagues to new heights, but the bigger test comes against KZ where BDD has been nothing short of a revelation for his own team. Although Afreeca’s Top Laner Kiin has had a good season (and superb playoffs so far), his play will need to be at an even higher level if he hopes to out do the hard carry potential that KZ Khan brings to the table. His ability to get ahead and stay ahead with the stifling pressure his jungler can bring to the Top side of the map has been a big winning condition for KZ that few teams have been able to decipher thus far. As Korea competes for their spot at MSI, Afreeca will have their work cut out for them as they try to represent their country at the highest level against the behemoth KZ line-up. LCK Week 7, Days 1/2/3 – Which teams will enter playoffs? Most prospective NA LCS teams – Will OpTic enter playoffs?